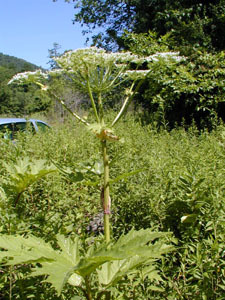 Giant hogweed (Heracleum mantegazzianum) is an invasive, non-native plant from Eurasia that was first identified in Connecticut in 2001 during a survey funded by the University of Connecticut and the U.S. Department of Agriculture. This Federal Noxious Weed has now been confirmed in 25 towns in all 8 counties, with many of the populations under control. 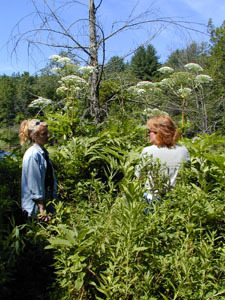 Educational outreach is underway to alert the public about Giant Hogweed, its serious health hazards, and provide control options. 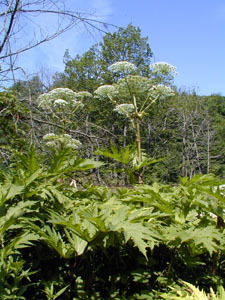 Giant hogweed is a biennial or perennial herbaceous plant that can grow up to 15 feet in height. Leaves may develop up to 5 feet in length. 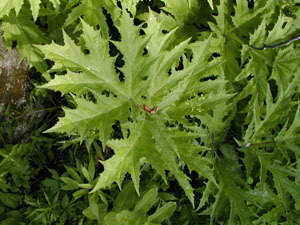 The hollow stems of the plant are 2 to 4 inches in diameter. Large numbers of small white flowers are borne on the umbel-shaped inflorescences that can grow to 2.5 feet across. The many seeds produced by each plant can remain viable in the soil for up to 7 years and can float on water for several days, further spreading the plants to new areas. 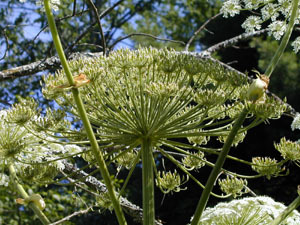 The sap of giant hogweed, a poisonous plant, causes large painful blisters on human skin and acts as an anti-sunscreen, which may cause skin to be more sensitive to sunlight. Eye contact may result in blindness. 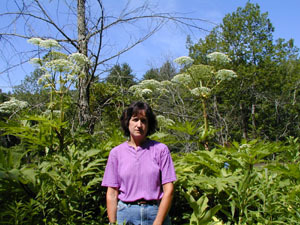 Giant hogweed has negative impacts to the environment as well. Plants have invaded natural areas such as riverbanks and woodland edges, where they displace native plants and upset the ecological balance of these important habitats. 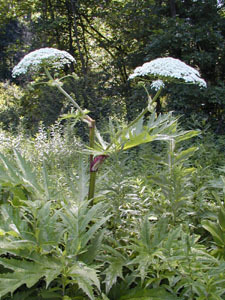 Giant hogweed can also be found in disturbed sites such as roadsides and along railroads, and it has been accidentally introduced into managed landscapes. 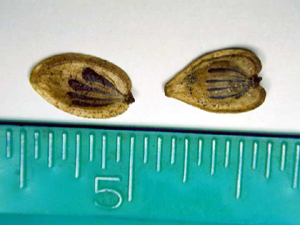 Seeds of Giant Hogweed (left) and Cow Parsnip (right). Note the heart-shaped lobes of the Cow Parsnip seed on the right.